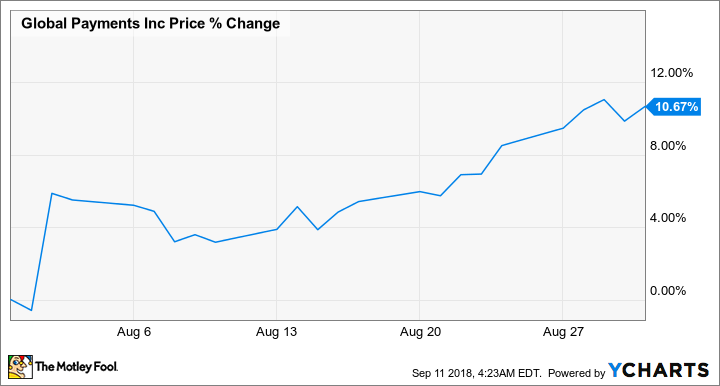 Global Payments Inc. (NYSE:GPN) stock climbed 10.7% in August, according to data provided by S&P Global Market Intelligence. The payment processing company's stock rose following strong second-quarter results and news that it would spend $700 million to acquire AdvancedMD -- a maker of cloud-based software used by physicians for office management. Global Payments' second-quarter results arrived on Aug. 2, delivering big sales and earnings growth in tandem with the acquisitions news. Shares are now up roughly 26.5% year to date. The early August earnings release recorded strong results across the board. Adjusted revenue for the period came in at $982.5 million, up 18% from the $831.7 million in sales that Global Payments posted in the prior-year period. Operating income rose roughly 24% to reach $308.1 million, and adjusted earnings per share jumped 37% to $1.29, up from $0.94 in the prior-year period. AdvancedMD revolutionized medical office software in 1999 with the introduction of the industry's first true cloud solution. Today, the company continues to lead MedTech innovation with Rhythm, a complete cloud suite of smart applications that work in unison, accelerating collaborative workflow for every role of the practice. With Rhythm, staff members are empowered to thrive in the online age of healthcare and value-based reimbursement with essential clinical, financial, patient engagement and reputation management applications that are unified and available anytime, anywhere on any device. In the recent earnings call, CEO Jeffrey Sloan stated that the acquisition will provide Global Payments with quick and easy entry into the $9 billion addressable market for physicians' office management software. Motley Fool contributor Matthew Cochrane sees the deal as another great step in the company's push to diversify and expand the reach of its payment processing services through vertical integration.